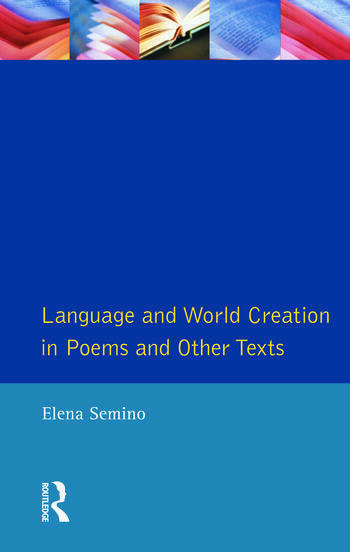 Language and World Creation in Poems and Other Texts introduces an interdisciplinary and practical approach to the analysis of poetry which focuses on text worlds, namely the contexts, scenarios or types of reality that readers construct in their interaction with the language of texts. The book demonstrates in detail three ways of approaching poetic text worlds, namely as discourse situations, possible worlds, and mental constructs. Clear and detailed introductions to linguistic theories of definiteness and deixis, possible world theory and schema theory are included, making the book accessible to readers who are unfamiliar with these frameworks. Elena Semino is a lecturer in the Department of Linguistics and Modern English Language at Lancaster University. She has published extensively in the field of stylistics, and was awarded the 1995 Poetics and Linguistics Association Prize for the best article published by a young academic.